William "Billy" Fourr was one of the first to settle in the Dragoon Mountains after the Chiricahua Apache Indian Reservation was dissolved in 1876. He arrived alone from California, in 1878, with 80 head of cattle. The tract of land that he chose to homestead was on the west side of the mountains about 5 miles south of the old Dragoon Stage Station. What attracted Billy Fourr to the site were its sycamore trees. He believed that they indicated a shallow water table. That hunch was proven correct and a dependable water supply was soon developed. In 1879, Fourr returned to California to retrieve his family and to purchase more cattle. Lynn R. Bailey, in his book "The Mines, Camps, Ranches and Characters of the Dragoon Mountains" noted that: "Upon arrival, the Fourrs lived under canvas until lumber for a house was freighted from Ross' sawmill in the Chiricahua Moutains. As a precaution, Billy built a stone fort on a nearby hill. Despite marauding Indians and rustlers, the Fourrs prospered." Intrigued by this "stone fort" statement, a friend of mine and I took to Google Earth to scan the hillsides near the mouth of Fourr Canyon to see if there was anything that might be the remnants of the old fort. This is what we found. Our thoughts were that this "ring" might be what we were looking for. Online there are several references to "Fourr's Fort" with a few posted photos of the structure, but no description of its location. Several of the websites, mistakenly associate the fort's history with that of the Dragoon Springs/Butterfield Stage Station. We felt confident that the Google Earth image was of the fort. I just needed to get down there and confirm it. William Fourr was described as cantankerous and grumpy. When the lands west of his property were designated as a Forest Preserve and then later incorporated into the National Forest, he continued to treat those areas as his own. He resisted official directives to limit the number of cattle and often blocked access to other legitimate users. The owners of the modern Fourr Ranch continue that tradition of limitng access. The gate at the entrance to their ranch has several "No Trespassing" signs. 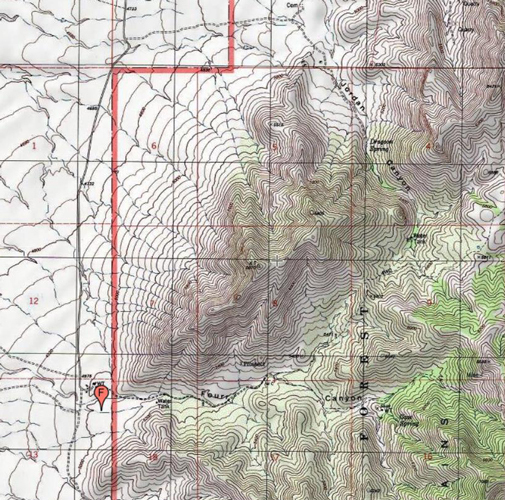 On this topographic map, the heavy red line is the National Forest Boundary. The public National Forest lands are to the east(right) of the boundary line while the private Fourr Ranch property is to the west(left). The ranch headquarters are at "F". The fort is on a hillside a few hundred yards into the Forest east of the Fourr Ranch buildings. A larger version of this map is located here. There are no roads that connect to Fourr Canyon on the Forest side of the boundary. On an earlier trip to a mine site in the upper canyon, I had accessed the area by walking a route through Jordan Canyon. A write-up of that trip is posted here. For my trek to the fort, I decided to park on the Jordan Canyon Road and then make my way south on foot between the Forest boundary fence and the steep slopes of the mountains. In May, there was a lot of tall grass to navigate. I was thankful for my trekking poles! Occasionally there were traces of a trail. I do not know if this was due to livestock or human traffic. These fence posts are made from split juniper logs. This is an "old school" fencing technique. A General Land Office Survey Marker from 1925 was spotted along the fence line. The GLO was the first Public Land Survey agency in this country. It became the BLM in the 1940's. Since the fort is only a few hundred yards away from the Fourr Ranch buildings. I was somewhat nervous to be in the area on foot. I was not concerned about trespassing , but I did not want to make contact with any free roaming dogs. A hound did detect my presence and sounded off, but did not approach. A person came out of one of the buildings and I am pretty sure that he saw me, but no contact was made. The main house constructed by Billy Fourr is the two story building to the far right in the photo. At one time, it was supposed to have been the finest house in Cochise County. As expected, the fort was found on the shoulder of a ridgeline east of the Fourr Ranch headquarters. 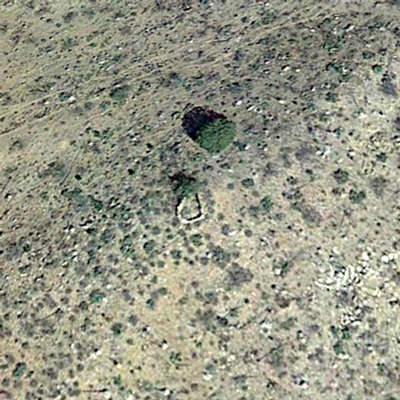 The Google Earth view of the fort shows the outline of the walls to be pear shaped. I estimated the length to be about 20' and the widest part of the "pear" to be around 10'. There is no break in the wall to serve as a entry way. It was difficult to judge the finished height of the walls. Quite a few of the stones have tumbled down. Perhaps the walls had been around 5' tall. Mr. Fourr was described as a short man. Had the walls been constructed to accomodate him? Were the openings in the walls gun portals? I did not go into the fort to see what the views were like through those openings. This "fort" was a very simple structure. There does not appear to have been a roof over the walls. Whatever protection was offered by the stone walls was certainly better than that provided by a tent canvas, but the persons who were inside would have had to have been active in their defense. This was not a bunker in which the folks could have simply hunkered down and waited the enemy out. The location would have been an excellent observation post and firing position There are commanding views down onto the ranch site and beyond. The fort is several hundred yards from the current buildings though. It would have been a challenge to get from there to the fort while under atack. Perhaps the layout of the original ranch was different and the living areas were closer than today. Was the fort ever used? I have not found any information that it was or that the Fourrs ever came under attack. Settlers a few miles away in the Cochise Stronghold area had to frequently contend with Apache raiders until the late 1880's. The house that Fourr eventually built seems like it would have been a fortress in itself. It is described as having adobe walls three feet thick. That house was not constructed until 1898, however. Whatever the situation was with the Indian raiders and other bad actors, the Fourrs persisted. Mr. Fourr remained at his ranch until his death in the 1930's. A few miles south of Fourr Canyon is the westside Stronghold Canyon. This canyon was one of the living spaces in the Dragoon Mountains that was used by Cochise and his group of Chiricahua Apaches whenever they were in the area. The rugged nature of the canyon allowed it to serve as a natural fortress or stronghold. There was water, grass and food resources available. Standing on either side of the entrance to the canyon are massive granite rock formations. This photo taken by the photographer C.S. Fly in 1887 is of one of those formations. This photo is the 2015 view of the rock formation above. These rock formations are on the opposite side. The road ends at a trailhead for the "Cochise Trail". That trail makes its way on up through Stronghold Canyon to a divide. From there it drops down into an eastside canyon. The area on the eastside is known as Cochise Stronghold. 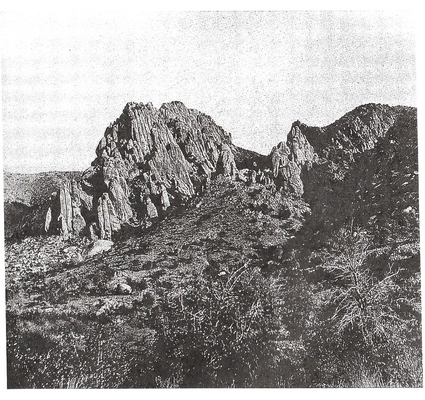 It was in that area that Cochise died in 1874. This is a primitive campsite in Stronghold Canyon. Except for the road, I am thinking that this place is probably pretty similar to what it would have been like in the times of Cochise. In the fall of 1872, Cochise was in the westside Stronghold Canyon area when he received word that a small party consisting of an Army general, the general's aide, two Apache scouts and Cochise's friend Thomas Jeffords were making their way into the Dragoons. The general, Oliver Howard wished to speak with Cochise about working out a peace agreement between the Apaches and the US Government. Cochise agreed to a meeting and after several days of talks an agreement was reached. The culminating meeting is supposed to have occurred at Dragoon Springs at the north end of the mountains. Historians have often wondered where the specific locations were that the negotiations took place. 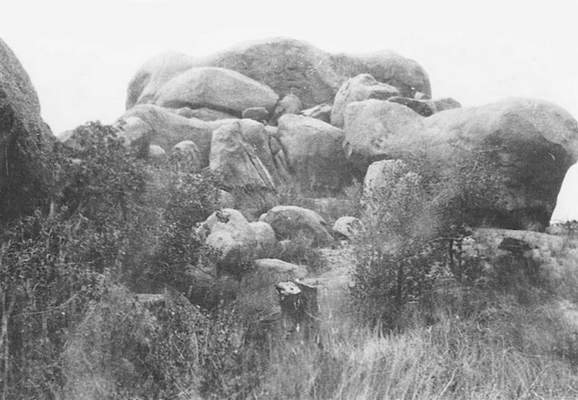 One of the possible sites may be shown in a photograph that was taken in 1913 by Robert Forbes. Mr. Forbes was shown the site by Billy Fourr. Thomas Jeffords is the person who likely identified the spot to Mr. Fourr. This may have been where Cochise spoke to his lieutenants about the peace deal. This is that same spot as seen on a recent visit. I was recently shown the site by a friend who came across it while walking an area near Stronghold Canyon. 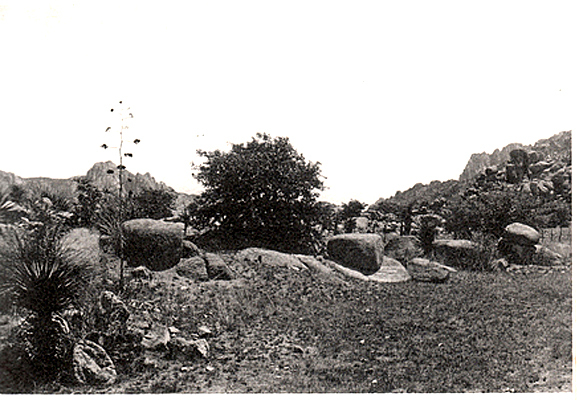 In the old photo, it appears that some axework had been done to remove a tree blocking the view of the rock formation.. As can be seen in this recent photo, that action would have to be repeated to re-gain that same view. This is a side view of the rock formation. The large flat surface to the right side is thought to have been the major "conference" area used during the peace negotiations. The sites represented by the two historic photos above are not marked or otherwise identified for visitation. The Forest Service has identified one Native American inhabitation site on the westside of the Dragoons. It is known as Council Rocks. 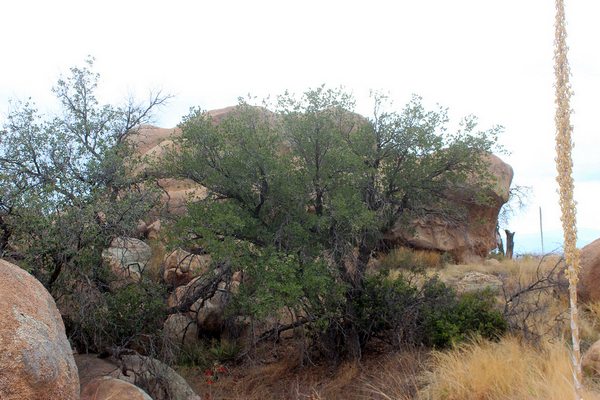 It is not known whether this site was used in the treaty negotiations between Cochise and the US government. 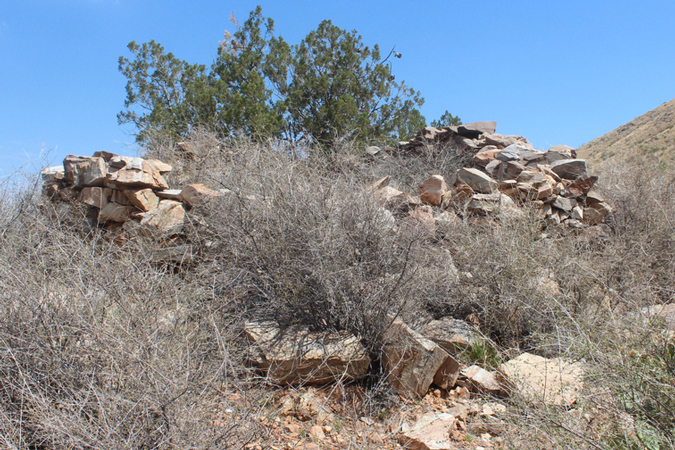 The site is identified as an early Mogollon peoples site dating back many years before the Apaches were in the area. 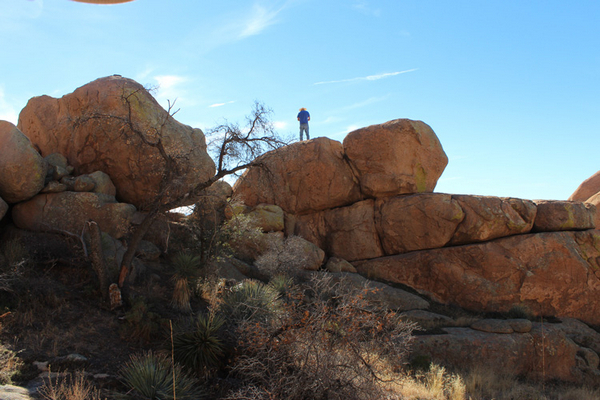 There are petroglyphs, rock mortars, and shelter sites at Council Rocks. The name of the cone shaped hill in the distance is Knob Hill. During the time of the negotiations between Cochise and the government, a white flag was supposedly erected on the top of the hill to signify that the negotiations were underway. After the peace talks, the hill was known as Treaty Hill. Under the conditions of the treaty that was negotiated, the Chiricahua Apache Indian Reservation was created. The Dragoon Mountains became a part of that reserve. Unfortunately, Cochise died soon after in 1874. His followers were not able to hold things together and the reservation was dissolved in 1876. Many of the tribe were moved to reservations elsewhere. Dis-satisfied with life there, some returned to this area. That created many problems for the new settlers who had moved in.